Dynamic programming was invented by a prominent U.S. mathematician, Richard Bellman, in the 1950s. Dynamic Programming is nothing to do with computer programming. Here programming means planning. It is a method for optimizing multistage decision making process. 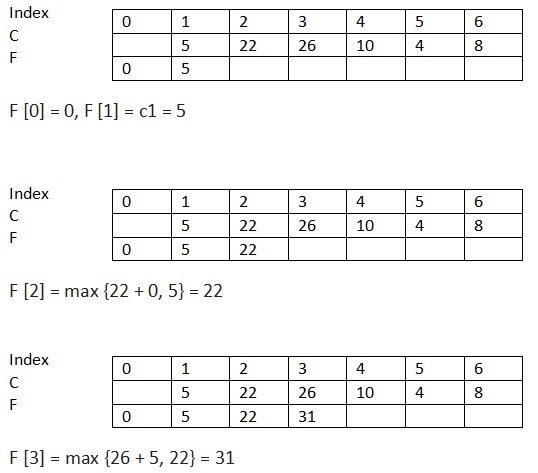 It is an algorithm design technique always considered to solve optimization problem. More efficient than “brute-force methods”, which solve the same subproblems over and over again. Dynamic programming is used to solve problems which have overlapping sub-problems. When problem breaks down into recurring small dependent sub-problems. When the solution can be recursively described in terms of solutions to sub-problems. Dynamic programming algorithm finds solutions to sub-problems and stores them in memory for later use. It is sometimes considered the opposite of recursion. Where a recursive solution starts at the top and breaks the problem down, solving all small problems until the complete problem is solved, a dynamic programming solution starts at the bottom, solving small problems and combining them to form an overall solution to the big problem. It is used to convert algorithm of complexity 2n to O(n3) or O(n2). It’s always better if you understand the Dynamic programming with the help of problems. Let’s start with the easiest one Fibonacci series. We can define a recursive method using this recurrence relation. For example: suppose that we want to calculate 6th Fibonacci number using above method. to compute F(4). 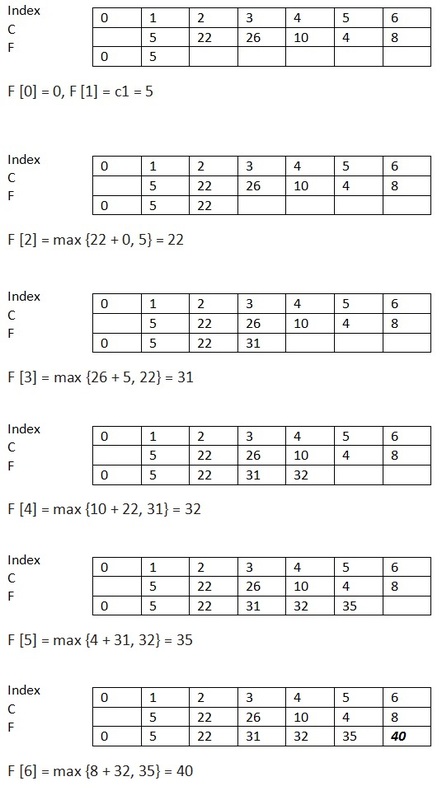 If you will trace out the entire algorithm, you will observe that F(4) is computed two times, F(3) is computed three times, f(2) is computed five times, F(1) is computed eight times, and so on. We are re-computing the same values many times. The growth of redundant calculation is exponential. We can improve it using Dynamic programming. We can use a single dimensional array as a cache to store the result of each computed Fibonacci number and before computing we will check in this array that if the value already exist. If exist then no need to recomputed. Actually to calculate Nth Fibonacci we don’t need all the Fibonacci number from 1 to n-1, we just need previous two numbers ie (n-2) and (n-1). Coin Row Problem : Coin-rowproblem There is a row of n coins whose values are some positive integers c1, c2, . . . , cn, not necessarily distinct. The goal is to pick up the maximum amount of money subject to the constraint that no two coins adjacent in the initial row can be picked up. There is an integer array consisting positive numbers only. Find maximum possible sum of elements such that there are no 2 consecutive elements present in the sum. To solve this problem using Dynamic Programming first we will have to define recurrence relation. Let F[n] is the array which will contain the maximum sum at n for any given n. The recurrence relation will be. F(0) = 0, F(1) = Coins. This is very easy to understand. While calculating F[n] we are taking maximum of coins[n]+the previous of preceding element and the previous element. F will have the final value.